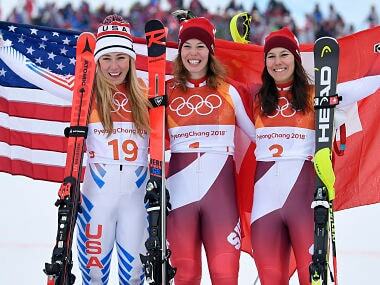 Pyeongchang: Switzerland's Michelle Gisin consigned American Mikaela Shiffrin to silver after storming to victory in the Olympic women's alpine combined on Thursday. 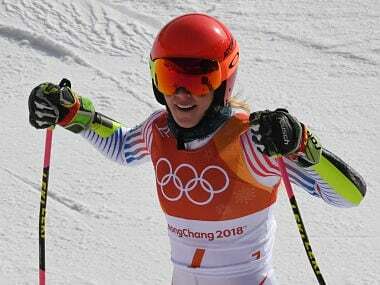 Shiffrin, who won the giant slalom gold in Pyeongchang but could only finish fourth in her favoured slalom, was almost a second back, while another Swiss racer, Wendy Holdener, took bronze at 1.44sec. Lindsey Vonn, leader in the downhill, failed to finish the slalom. The race had been touted as a rare showdown between the past and future of women's alpine skiing, but Gisin proved to be the fly in the ointment in the battle between Vonn and Shiffrin. The combined, the last individual ski racing event of the 2018 Winter Games, was their only head-to-head matchup in South Korea. Shiffrin skipped the downhill after the combined was brought forward a day and Vonn, battling back from a raft of injuries, missed the technical events to focus on the super-G and downhill. The pair rarely compete against each other on the World Cup circuit because of their preferred specialities, but there was a definite feeling that the baton has been passed, not only in the US team but also globally. The 33-year-old Vonn, who has the most World Cup victories by a female skier (81), is closing in on Ingemar Stenmark's record of 86 World Cup wins and has vowed to ski on until she breaks that mark. Shiffrin, 22, has already racked up 41 World Cup victories. 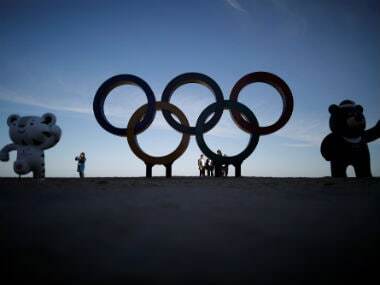 Given her age and depending on her staying injury-free, she could realistically target not only that record but also many more Olympic and world championship medals. But the Swiss team was having none of it, the 24-year-old Gisin following with aplomb her elder sister Dominique's tracks — she won joint downhill gold with Tina Maze in Sochi. First up for the Swiss, however, was defending world combined champion Wendy Holdener, 10th fastest after the downhill, who laid down an electric slalom run of 40.21sec to lead with 2:22.34. 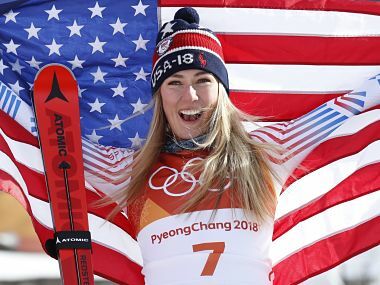 Shiffrin took to the start gate with a 0.76sec advantage over Holdener, who won silver in the Pyeongchang slalom and world combined silver last year, and the American could be seen chewing her lips in stress as she readied herself. Despite losing some time midway through the course, Shiffrin powered through to the bottom to take first place, 0.47sec ahead of Holdener. But then came Holdener's team-mate Gisin, who ripped down a near-faultless run to leapfrog Shiffrin by almost a second. Norway's Ragnhild Mowinckel, second fastest in the downhill and seeking a third medal of these Games after giant slalom and downhill silvers, faded as she laboured down the polished Jeongseon course under floodlights. Vonn won downhill bronze on Wednesday. But there was to be no fairytale send-off for the American, who struggled from the offset and only lasted a couple of gates before skiing out.